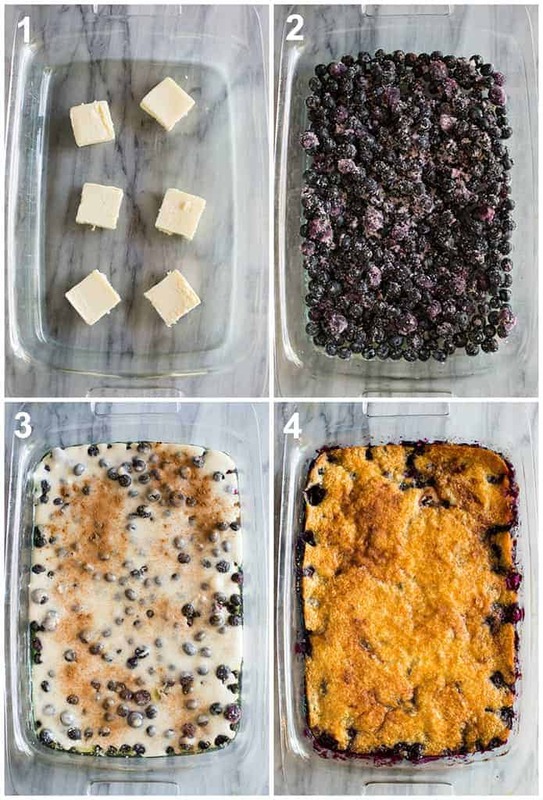 An easy Blueberry Cobbler recipe made with fresh or frozen blueberries and basic pantry ingredients. This blueberry cobbler recipe was born out of my love for warm, comfort-food desserts made with fresh fruit. My peach cobbler recipe is one of the most loved recipes on the site, and this Triple Berry Crisp is one of my personal favorites. 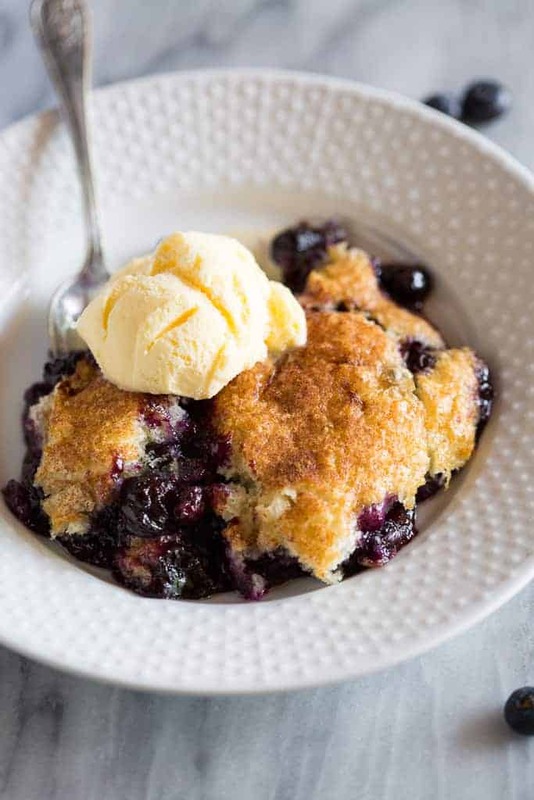 Blueberry cobbler is a warm and sweet dessert recipe that takes just a few minutes to prepare and will satisfy every dessert craving you have ever had; it’s just that good! This recipe is an adaptation of my very popular Peach Cobbler recipe and both recipes can be made with fresh or frozen fruit! 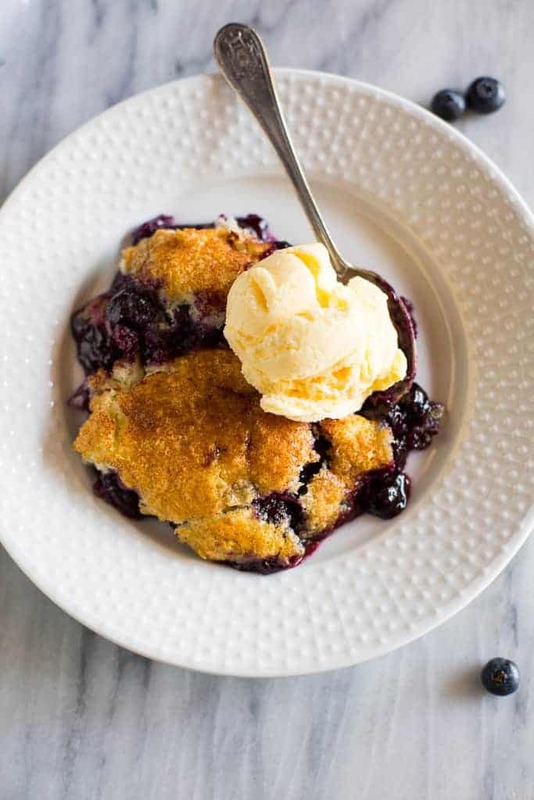 Blueberries: You can use fresh or frozen blueberries for this cobbler recipe. Sugar: A little granulated sugar mixed in with the blueberries will help create a sauce from the blueberries as they bake. Lemon Zest: A touch of lemon zest helps boost flavor. Butter: A few tablespoons of butter, melted at the bottom of the pan, keeps the cobbler from sticking to the pan, and adds to the amazing flavor. Batter: The batter for this cobbler is made from flour, sugar, milk, baking powder, salt, and cinnamon. The combination of those ingredients, layered on top of the blueberries creates a delicious cake-like topping with a slightly crispy crust and soft center. It reminds me of an old-fashioned dutch-oven type of cobbler. Prepare your pan: Preheat your oven to 350 degrees F and slice the butter into pieces. Add the butter to a 9×13 inch baking dish.Place the pan in the oven while it preheats, allowing the butter to melt. Once melted, remove the pan from the oven. 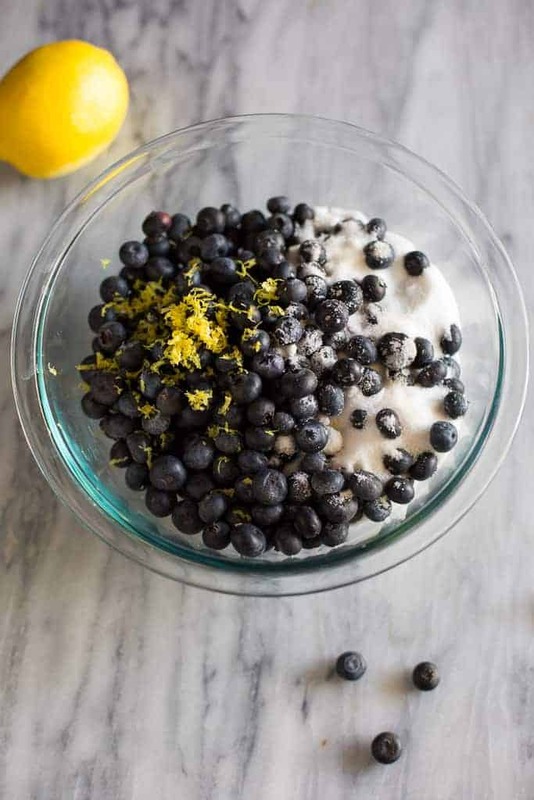 Prepare the blueberries: Add blueberries, sugar and zest to a bowl and stir to combine. Prepare the batter: Mix the batter ingredients together: flour, sugar, baking powder, and salt. Stir in the milk, just until combined. Pour blueberries over melted butter in pan, drizzle the batter over the top, and sprinkle with a little bit of cinnamon. Bake: Bake at 350 degrees for about 35-40 minutes, or until lightly golden on top. Serve: Serve the cobbler warm from the oven with a scoop of vanilla ice cream, if desired. Can I use frozen fruit to make cobbler? Yes! 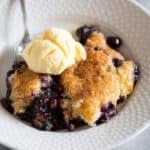 Both this blueberry cobbler recipe and my peach cobbler recipe can be made with fresh or frozen fruit. Frozen fruit doesn’t even need to be completely thawed before using. There will likely be a little extra juice from the frozen fruit as a result of the thawing process but that is totally fine! The extra liquid will make a slightly more syrupy/saucy cobbler that tastes just as amazing. 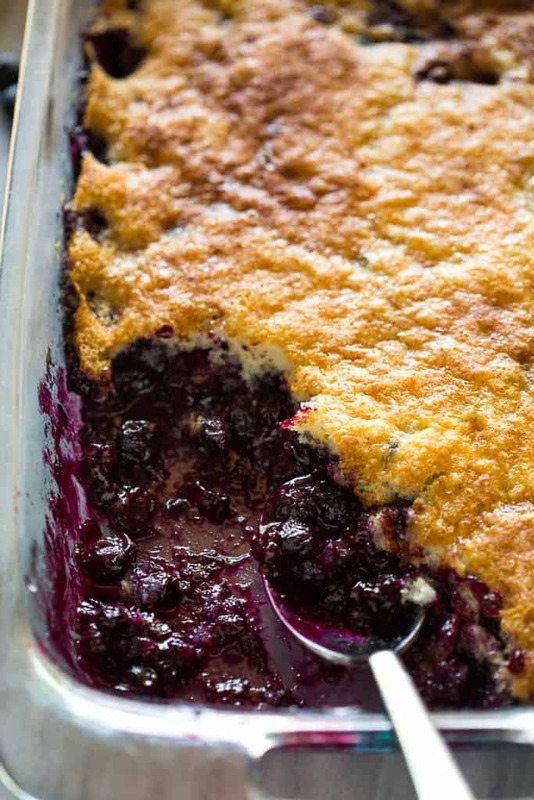 Blueberry cobbler is best enjoyed warm, right after it’s baked. Store leftover cobbler covered, in the fridge for 4-5 days. To reheat blueberry cobbler, use the microwave or oven. To reheat in the oven, remove it from the fridge and allow it to come to room temperature. Bake at 350 degrees F for about 20 minutes or until warmed through. (Place tinfoil over it if it’s browning too much). I was looking for a sweet recipe for the whole family and I stumbled on this article. I read and followed the instructions carefully and I made it deliciously! Every member of my family is so happy! Thanks for this! I’m so glad you liked it! Thanks Kate. Amazing! I have made your peach cobbler many times and thought I would give this a try! Soooo glad I did. Fantastic! Thank Amy, I’m really glad you were able to try it!